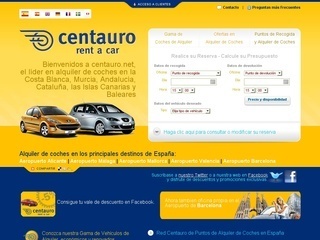 Centauro rent a car is located outside Malaga airport and has offices in Spain: Costa Blanca, Murcia, Andalusia, Catalonia and Canary Islands. Extra insurance or a 300 Euro deposit for possible vehicle damages. Minimum age for car hire in Malaga is 21 years old and the maximum age is 79 years old. Full tank of fuel is paid in advance and it is not reimboursable. Visa or Mastercard credit card is required. You are not allowed to drive outside of Spain from Malaga. *Prices and details about hiring a car with Centauro were valid at the moment of writting this article. Visit our car hire forum to post your Centauro reviews.